Laila Abdo (Pompey) a first-generation Lebanese-American, grew up in Harrisburg, Illinois. In May, Abdo received a Bachelor of Science in Biology and a Bachelor of Arts in Music from Southern Illinois University-Carbondale. Abdo played the principle role of Callie in the collaborative endeavor The Faustian Flag (2012), led by director Patrick Sutton at the Gaiety School of Acting in Ireland. She appeared in Stone Soup Shakespeare's touring production of As You Like It (Jaques/Silvius/Charles) as well as the 2014 reading of Titus Andronicus (Aaron the Moor). At SIUC, she has been in Die Fledermaus (2014) and Ragtime (2013). During Southern Illinois Music Festival, Abdo sang in the chorus of Carmen (2013). She is an accomplished musician who plays piano, trombone, and euphonium. Abdo is also multilingual, with fluency in Arabic and Spanish. Sydney O'Melia Ambos (Isabella) has been a community theater player for 16 years. While she loves all thing creative, the stage is her first love. She resides in Herrin, IL where she runs her photography business, Artistic Photography by Sydney. Most recently, she played Chiron is Stone Soup's reading of Titus Andronicus. Susan Patrick Benson (Mariana) recently made her stage debut at Play2C Theater in Berlin. Her NYC resume includes Ensemble Studio Theatre, Currican Theatre, HB Playwright's Foundation, LaMaMa ETC as well as annual appearances in the legendary Rev. Al Carmines' Christmas Rappings. Regional Theater work includes Luna Stage (Fastest Woman Alive) The Cleveland Play House (The Man Who Came to Dinner, Animal Farm), Karamu Theatre, Porthouse Theater (Inherit the Wind, Much Ado About Nothing), Strand Theatre in Galveston, Stamford Theater Works (A Coupla White Chicks...), The Public Theater of Maine (An Italian-American Reconciliation), and TheaterWorks of Hartford where she appeared in How I Learned to Drive and received a Connecticut Drama Critic's Outstanding Performance Award for her work in The Laramie Project. Favorite roles include Hedda Gabler, Charlotte Corday in Marat/Sade, and Laura Bush in the world premiere of Jean Claude Vanetelli’s Fear Itself. Susan performed in Pasty Cline, Mid Life Crisis and Steel Magnolias for McLeod Summer Playhouse. She produced, directed and acted in THE NEW PLAY SERIES at HB Playwrights Foundation Theatre, NYC and has directed numerous productions for SIU Theater. Her production of Dreamtrippin’ was selected for performance at KACTF 2007. A member of VASTA Ms. Patrick Benson taught at Weist-Barron School and HB Studio where she was head of the voice/speech department. She has coached dialects for numerous regional theatres and off Broadway productions, conducted workshops for ATHE, SETC, Visiting Theatre of Japan, Illinois High School Workshop, local theaters and conducted an international voice workshop for German Theatre Abroad (GTA) and is a recurring guest voice teacher for The Actor’s Space, Berlin. has performed at venues in NYC including Ensemble Studio Theatre, Currican Theatre, HB Playwright's Foundation, LaMaMaETC as well as annual appearances in the legendary Rev. Al Carmines' Christmas Rappings. Regional Theater work includes Luna Stage (Fastest Woman Alive) The Cleveland Play House (The Man Who Came to Dinner, Animal Farm), Karamu Theatre, Porthouse Theater (Inherit the Wind, Much Ado About Nothing), Strand Theatre in Galveston, Stamford Theater Works (A Coupla White Chicks...), The Public Theater of Maine (An Italian-American Reconciliation) , and TheaterWorks of Hartford where she appeared in How I Learned to Drive and received a Connecticut Drama Critic's Outstanding Performance Award for her work in The Laramie Project. Favorite roles include Hedda Gabler, Charlotte Corday in Marat/Sade, and Laura Bush in the world premiere of Jean Claude Vanetelli’s Fear Itself. She most recently performed the role of Louise in Always… Pasty Cline for McLeod Summer Playhouse. She produced, directed and acted in THE NEW PLAY SERIES at HB Playwrights Foundation Theatre, NYC and has directed productions of Copernicus Rising, Talking With…, A Christmas Story, and Intimate Apparel for SIU Theater. Her production of Dreamtrippin’ was selected for performance at KACTF 2007. A member of VASTA Ms. Patrick Benson taught at Weist-Barron School and HB Studio where she was head of the voice/speech department. She has coached dialects for numerous regional theatres and off Broadway productions, conducted workshops for ATHE, SETC, Visiting Theatre of Japan, Illinois High School Workshop, local theaters and conducted an international voice workshop for German Theatre Abroad (GTA) in Berlin Germany. She is currently the voice and speech specialist for the SIU Theater Department. Josephine Beyke (Provost) holds a BA in Literature from Kentucky Wesleyan College, where she won awards for both literary analysis and original fiction. On the stage, she performed the role of Tiresias in Antigone--for which she was nominated for an Irene Ryan Award--a disciple in Godspell, and with the Owensboro Symphony Orchestra in Tosca and Schubert's Mass in G. In Southern Illinois, she has worked with Carbondale Community Arts, SIUC, and the Stage Co., amongst others. She recently acted as guest lecturer for Stone Soup Shakespeare's production of As You Like It. Her favourite Shakespeare play is Richard III. Todd Brown (Lord Angelo) is a middle-aged man who does Shakespeare so he doesn't have to buy an awesome red convertible. He is a baker, a shopkeeper, a drummer and a father. Hasanah Brown (Escalus) is 12 years old. She loves Shakespeare. She has had roles in Twelfth Night, Much Ado About Nothing, King John, and As You Like It. Her favorite role is Viola in Twelfth Night. 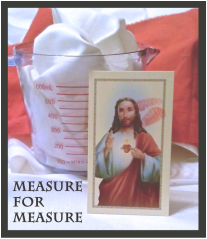 She is very excited to be able to participate in this production of Measure for Measure. Da'Veon Coria Burtin (Mistress Overdone/Friar Peter) is a Sophomore Theater Performance Major at Southern Illinois University, and this is his first role with Stone Soup. He is very grateful to Julia Stemper for the opportunity to be in an amazing show. He would like to thank his theatre family and musical theatre family at Southern Illinois University for their gracious and loving support! Although rather old and lacking either talent, charisma, or technique, Kim Curlee (Lucio) has been blessed of late to have been performed in "Mother Hicks" at the Stage Company, a Susan Patrick Benson production Sam Shepherd's "Fool For Love," at SIU, and in 2013 he had the good fortune to tag along with the Stone Soup Shakespeare production of "The Tempest." There may have been more, earlier shows dating back to the mid-eighties, but they seem to have been deleted from his hard drive. Alexsia Patton (Friar Thomas/Messenger/Abhorson) is 17 and a Junior at Gallatin County School. She’s been acting since she was 6 years old. Alexsia has been a member of Shakespeare Reading Group for four years. This is her third time acting with Stone Soup Shakespeare. Her favorite Shakespeare Character is Hamlet. Alexsia thinks Shakespeare has been around for so long because he is brilliant. Matlyn Rybeck (Claudio/Juliet) is an aspiring sophomore Theater Major at SIUC with an excitingly challenging Minor in Japanese. She appeared as the title roles in Eurydice (Eurydice) and Joan's Laughter (Joan of Arc) on SIU stages, and has done theater since high school. Her favorite role she's ever performed was as Winnie the Pooh when she dressed in a giant bear outfit. She is so very happy to finally attempt portraying a male (human) character in Measure for Measure! Quinton WAYNE Sledge (Duke Vincentio) was named after John "The Duke" Wayne...and is now playing THE DUKE. Coincidence? We think not. Julia Stemper (Francisca, a nun/Barnardine) is tickled to be starting the 5th Season of Stone Soup Shakespeare with such an amazing group of talent. She was last seen as Rosalind in the 2015 Tour of As You Like It. Stone Soup credits include The Tempest, A Midsummer Night's Dream, Romeo and Juliet and multiple staged readings. In Chicago she has had the privilege of also working with Filament Theatre, Ka-Tet Theatre, The Plagiarists, First Folio, Red Tape and Lifeline Theatre. Before transplanting to Chicago Julia completed her Masters at the Royal Conservatoire of Scotland in Glasgow. Julia also has had gobs of fun performing in Washington, DC; the Twin Cities and Dublin.